Kristiina studies animal behavior, focusing on observational methods. For her PhD, she studied parental care in tropical frogs. 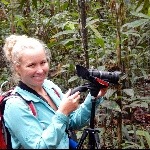 She has done field work with frogs, freshwater fish, tropical wrens, and hummingbirds. She also learned how to train sea lions and monkeys with positive reinforcement methods in zoos, and has succeeded in training wild hummingbirds! Good luck! Best wishes for helping wildlife survive humans! Gracias William! Estamos emocionados para compartir los resultados!! Thank you Jorge!! Your support means so much to us! Yes!! Everyone needs the opportunity to support research!